Today on our 2017 Emmy odyssey it's the turn of FX and Fox shows, both owned by the same parent company. 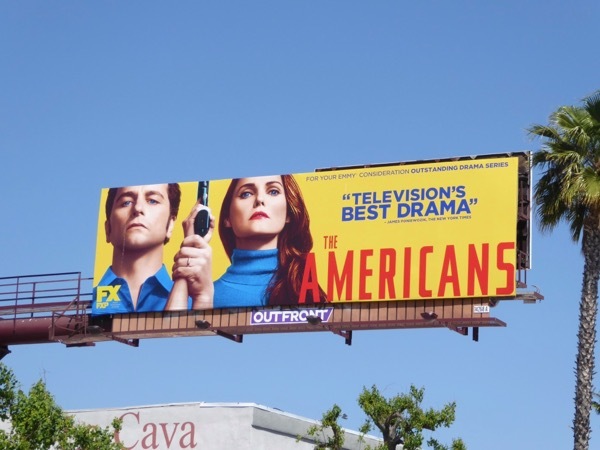 First up is FX's Russian sleeper spy drama The Americans, starring Matthew Rhys and Keri Russell, which follows the exploits of their married couple carrying out covert missions on U.S. soil in the 80s whilst posing as a Washington, D.C. suburban family. Obviously due to recent political events with Russia's hacking the presidential election and the ongoing FBI inquiry into Donald Trump's campaign connection, the espionage drama is suddenly more timely than ever. 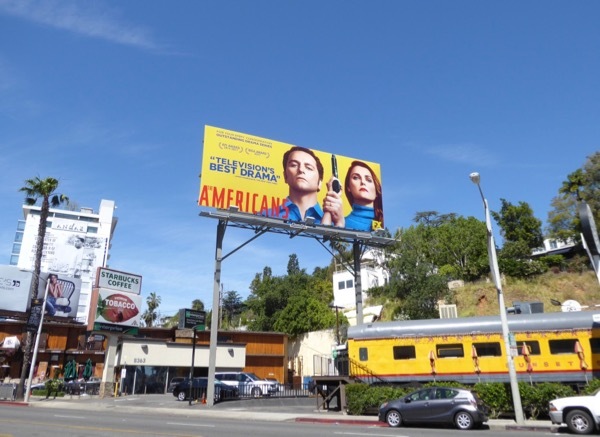 These Emmy consideration billboards for the show's fifth season were snapped along Ventura Boulevard on April 7 and above the Sunset Strip on April 27, 2017. 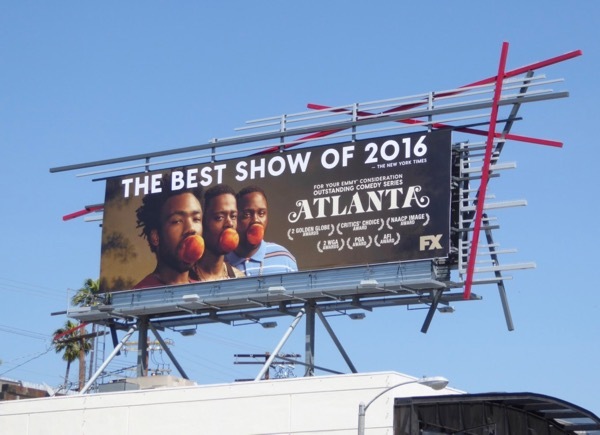 FX is always one of the first out of the gate when it comes to Emmy campaigning in the skies of L.A. and it's new acclaimed Donald Glover comedy, Atlanta, was snapped early on this year above the Sunset Strip on April 4 with this ad creative. Let's see if it does the trick. 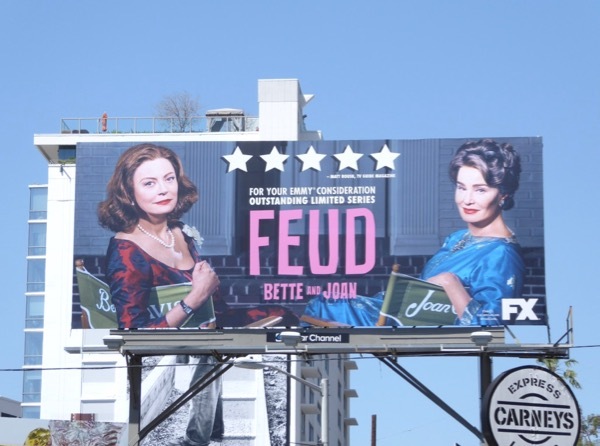 After starring in FX's horror anthology series, American Horror Story, for four seasons and winning two Emmys for her different roles, Jessica Lange teamed up with Susan Sarandon for Feud: Bette and Joan. Ryan Murphy's new anthology series delved into the rivalry between Hollywood legends Bette Davis and Joan Crawford and how their feud on the set of the 1962 film What Ever Happened to Baby Jane? began. 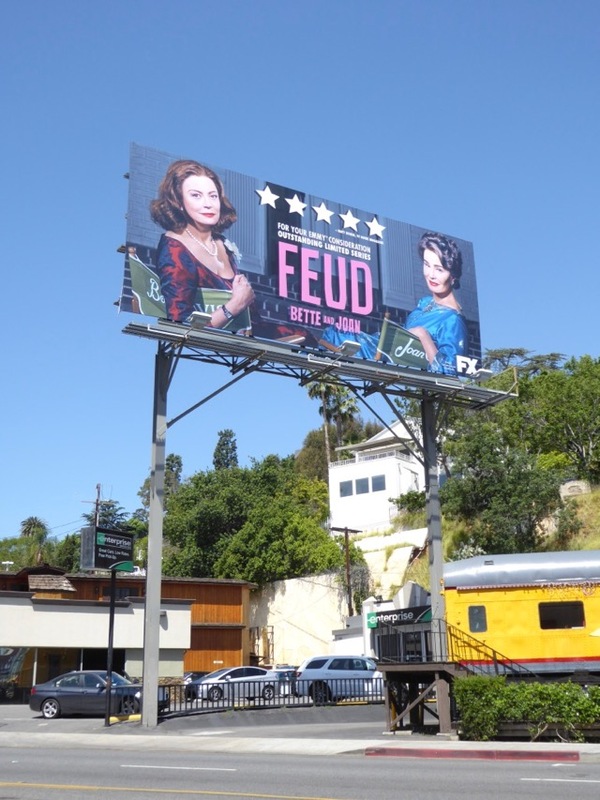 This Emmy consideration billboard for the show and leading ladies was spotted along West Hollywood's Sunset Strip on May 8, 2017. 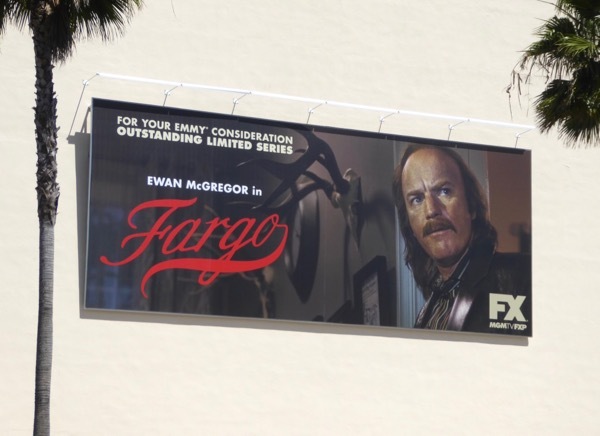 Meanwhile FX's black comedy-crime anthology spin-off of Joel and Ethan Coen's 1996 Fargo film was back for a third season, with Ewan McGregor playing twin brothers in the latest quirky storyline. 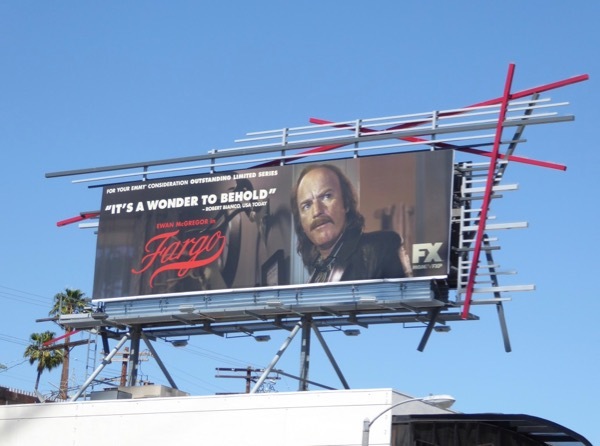 These Emmy FYC billboards for season three were photographed at Fox Studios along Pico Boulevard on April 29 and above the Sunset Strip on May 11, 2017. 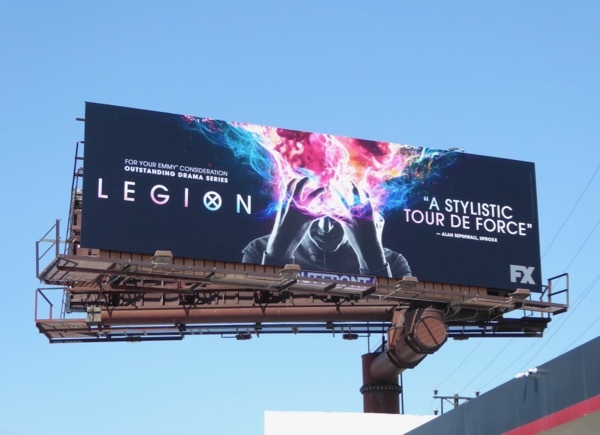 FX's new X-Men Universe series, Legion, was turning comic book TV adaptations on their head and offering something completely different tot eh superhero genre this season. Dan Stevens stars as Professor X's psychic son-in-hiding, 'David Haller', one of the most powerful mutants on Earth diagnosed with schizophrenia at young age, harboring an evil parasite in the depths of his psyche. 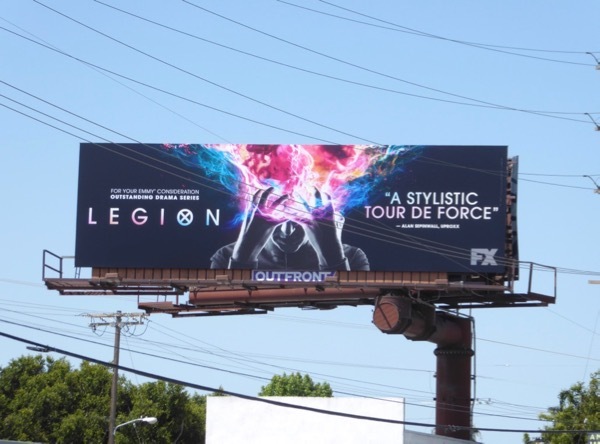 This psychedelic Emmy consideration billboards was photographed above Olympic Boulevard on May 28, 2017. Meanwhile in the world of Fox Television, The Mick sitcom starring Kaitlin Olson was making its comedic debut at the start of this year. This Emmy consideration for the hard partying aunt forced to look after her sister's three children when she fled the country was spotted along the Sunset Strip on May 28, 2017. 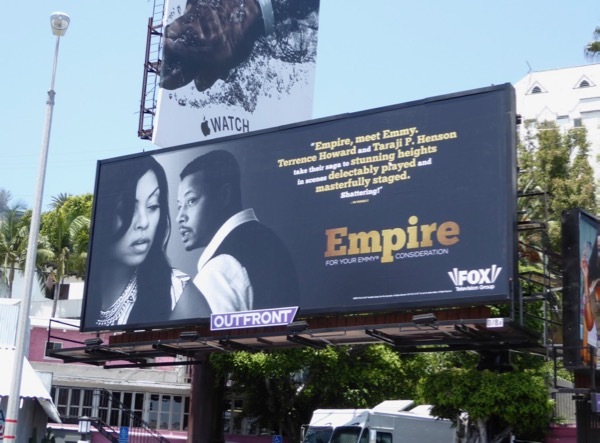 And Fox's ratings powerhouse hip-hop music industry drama, Empire, was back for its third season this past year and looking for Emmy consideration for the Lee Daniels created series and its stars. Golden Globe winner Taraji P. Henson has previously been Emmy-nominated for her role as 'Cookie Lyon', so will it be third time lucky for the actress and will Terrence Howard receive his first Emmy nomination for the playing the music mogul. 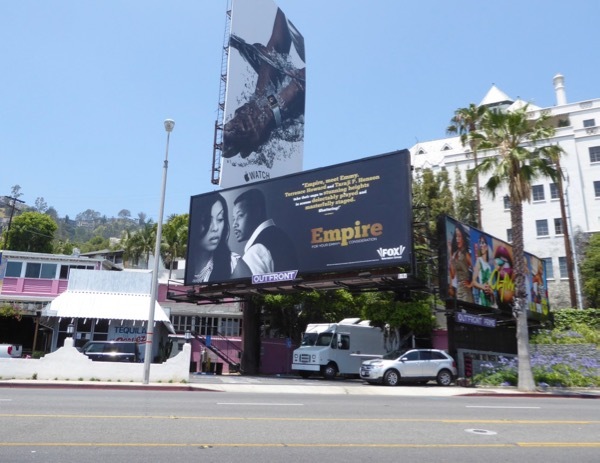 This Empire season three FYC billboard was spotted along West Hollywood's Sunset Strip on June 5, 2017. 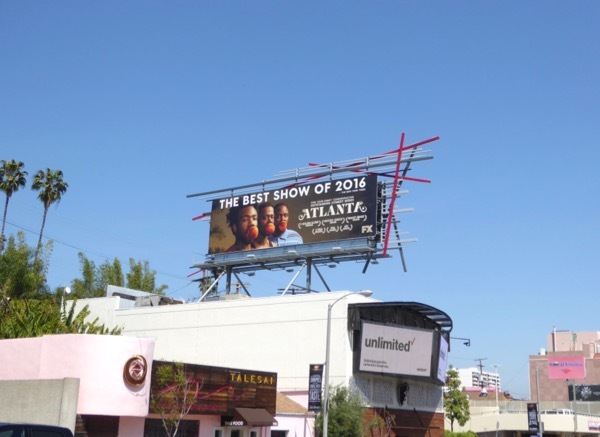 If you like these campaigns, be sure to check out last year's FX Emmy consideration billboards and Fox TV's Emmy 2016 billboards. Stick around for even more Emmy hopefuls filling L.A.'s skies this season in the days to come.